There isn’t a day in the TPS Teachers Network when I don’t encounter a post that sends me on an excursion or historical journey. Some are expected, but many are complete surprises that send me down a rabbit hole. It wasn’t quite a rabbit hole, but you just never know where a single comment will lead you. It all began with a post about Mother’s Day resources in America’s Story From America’s Library, a Library of Congress (LC) site for younger learners. The treasures shared inspired me to offer primary sources and stories about Teddy Roosevelt, which are useful in conjunction with The Legend of the Teddy Bear, a picture book. Others quickly shared more resources and teaching ideas. I can almost hear the teddy bear songs. Swapping stories about using primary sources and sharing stories told through primary sources is what the TPS Teachers Network is all about. The network is a professional social media platform designed to host and facilitate community conversations, connections, and collaborations that focus on using digital LC primary sources to improve student learning. Teachers can connect and collaborate with peers and scholars online using familiar social media tools such as posting, commenting, linking, and tagging . Fortunately, this exciting and purposeful communication takes place within a private, secure network. It derives its strength through fostering professional relationships among 7,000-plus users with similar interests. More than 90% are teachers and librarians, but museum educators, LC staffers, higher education teachers, and educational consultants are also among the members. Every state is represented, as well as overseas departments and several countries. 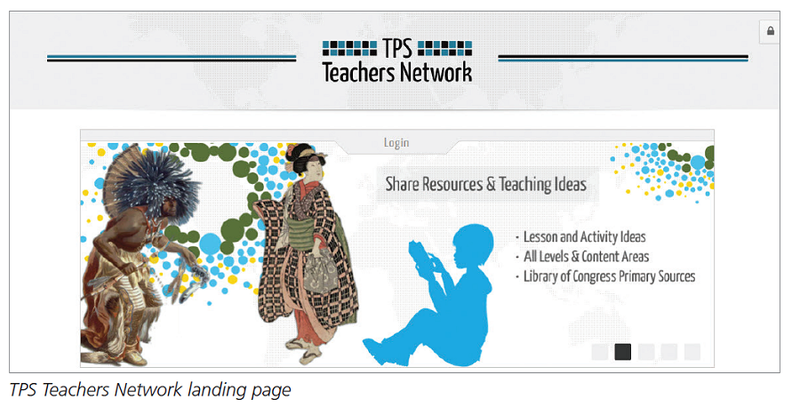 The TPS Teachers Network could be your new favorite go-to discussion tool. Discussions are often cross-curricular; resources and ideas are frequently adaptable for varied ages. And it’s not just for history teachers or about historic documents. Participation in a collegial network of this size is not as overwhelming as 7,000-plus users suggests. Users have control over the information they receive and read, as well as how much they participate. You are in control. There’s more about that later. Joining and participation are free, as are all LC resources. The network is organized into more than 75 public and private groups, which provide a structure; they are key to matching participants and their interests. All members automatically belong to the TPS Commons, the most general and largest public group in the TPS Teachers Network. It is a space for sharing ideas, resources, and strategies. Other public groups typically focus on topics of general educational and curricular interest. Representative groups include The Arts and Primary Sources; Civil Rights; See Think Wonder: Primary Sources in Early Childhood; World History; The Revolutionary War; Disability History; The American Jewish Experience; Maps and Geography; TPS Tech Talk; Bookmarks; and STEM. Private groups may be specific to a geographic region, state, professional development event, or very specialized interest. For example, the private Bering Strait group created a path leading to Chroni­cling America newspaper articles and Russian lobbying efforts to promote the purchase of Alaska. Sometimes, it is worthwhile to share ideas in both a private or smaller public group and TPS Commons. Members can learn about a group before joining by selecting the group icon. Read the group description, examine the list of recent content, and discover who else belongs and contributes to your learning. If you have questions, send a message to the group administrator. Group memberships range from fewer than 50 to hundreds; activity level varies widely. LET’S GET TALKING! HOW DOES IT WORK? Discussions are intended to share ideas and invite further investigation. Any member can initiate a discussion topic. Initial posts are brief enough to read quickly and refer readers to LC primary sources and other relevant primary sources or related materials. For example, I shared background information and primary sources related to the nonfiction work Killers of the Flower Moon: The Reign of Terror on the Osage Indian Reservation, which documents a little known event of the 1920s. A lively and informative continuing discussion followed; we all learned something new about American history and asked why we had never heard about the tragedy. We furthered our learning by discussing the pedagogy of teaching difficult topics and discovering resources such as FBI case documents. Topic discussion continued through comments and replies. The resources and pedagogical ideas shared will remain online for use by future TPS Teachers Network members. Cross-posting— Recycling and repurposing previous discussions are useful tools for expanding learning. A member created a discussion in the TPS Commons about the National Memorial for Peace and Justice when it opened in April. She took the time to provide core information and links to helpful resources. Another participant reposted that information in another smaller group: “I re-posted in the Civil Rights group to make sure that all the new members of that group could add to the discussion there, if they wanted.” She later shared an older discussion with links that related to an upcoming PBS American Experience program about the Chinese Exclusion Act. That post created awareness of the PBS program, the original discussion, and timely resources. The network helps busy educators. Albums and files— Albums for LC photos and graphics are another vehicle for sharing. Pairing Picture Books and Primary Sources, a series of individual albums, is a growing example of practical and teacher-friendly resources. Albums can include comments and are collaborative, exportable, and have a shareable URL. They are mini primary source sets. Files in standard formats are a convenient way to share material that doesn’t fit within the parameters of a discussion post. Common examples are PowerPoint presentations, professional development plans, or lessons. Embedding and tagging— The user-friendly discussion area and icon toolbar will look familiar to most users. There are the usual icons for formatting and inserting links or images. Photos or other images from the LC collections are often embedded in posts, enhancing learning and furthering discussion. Links to related posts or other pertinent resources further enhance the content. 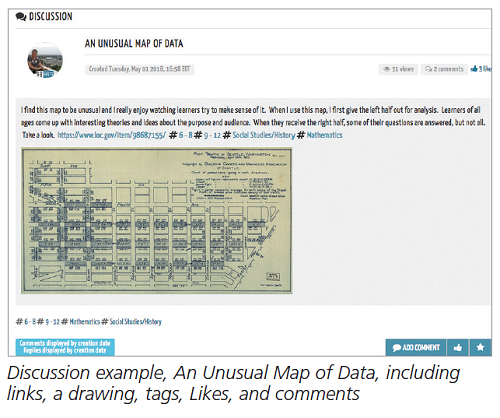 Photos and graphics from other primary source collections can be shared via links. Tags are another aspect and help current and future readers find additional resources. Tags options are using a preset list of grade levels and common subjects or creating custom tags. The user-reference feature adds a human touch. The University of South Carolina’s Center for Civil Rights History and Research hosts a private group for the organization’s participants. According to its mission statement, it does the following: “We focus on the history and contributions of African Americans to teach social studies. We encourage teachers to work with school librarians to engage with each other in the TPS Teachers Network.” Through the network, I first learned about TPS-Barat, an LC TPS program partner with a wealth of teaching resources. The network also keeps me informed about new collections and resources at the library through updates from LC educational staffers. It was where I first learned about iCivics Interactives, an interactive document analysis tool designed to introduce students to major questions in civics and history using primary sources. These resources are helpful for my teaching. Indeed, the network has become my personal professional development tool. And it’s all manageable. The daily average of all sharing—including discussions, files, albums, and comments—is approximately 15. Participants have control over how much they have to read through the number of groups they belong to; it’s OK just to belong to TPS Commons. Newest posts are first in any group; links to trending content are visible and helpful. Email notifications are another way for you to keep up; the frequency is up to you. Best of the Month and Network Insider posts help you discover what you missed or forgot. What you read is up to you. Favorites, search text, and discussion tag features enable you to track down topics you missed or want to revisit. Liking is another way to participate with commenting. Likes are encouraging to the discussion originator and can signal other participants about a hot topic. I will admit it is fun to see someone Like or comment on your post. And if you just want to read and lurk, that’s OK too. “Industry wide, about 90% of social media users are lurkers.” They want to learn, but may not be inclined to join in. The network is funded through an LC grant from the Educational Outreach Office’s TPS program to the regional TPS partner at Metropolitan State University–Denver. As a peer-to-peer platform, the TPS Teachers Network depends on its members to contribute resources and teaching ideas based on primary sources. Twelve network mentors and the network coordinator help keep the content fresh by initiating discussions and encouraging continuing discussion through their own engagement, posting questions, sharing their own experiences, helping beginners, offering feedback, and connecting with participants personally if possible. LC Educational Outreach staff members also help lead the way. Registration is easy at tpsteachersnetwork.org/register. The process requires creating a personal profile and avatar that may be your photo. An overview video will be helpful before or after joining. It is available on YouTube (tinyurl.com/y7gcwasq) or the TPS Teachers Network homepage. 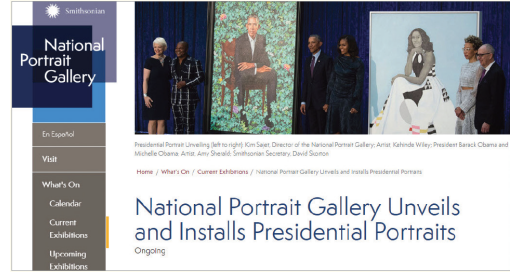 A post about the unveiling of Barack and Michelle Obama’s portraits at the Smithsonian’s National Portrait Gallery led to an article about the artists and paintings. Both portraits represent the Obamas’ cultural heritage. Mrs. Obama’s dress design was inspired by the unique quilts made by quilters in Gees Bend, Ala., a historic tenant farming community. Searching the LC American Folklife Center enabled sharing photos, links, and historic information, as well as a lively discussion about learning from portraits as primary sources. This conversation complemented previous discussions about quilts as primary sources in The Arts and Primary Sources group; our learning expanded in diverse directions. Murphy, Frank and Gijsbert van Frankenhuyzen, The Legend of the Teddy Bear, Sleeping Bear Press, 2000. Gran, David , Killers of the Flower Moon, Penguin Random House, 2017. Little, Joey, “You Know Who’s Lurking? 90% of Social Media Users Don’t Publicly Interact, ” LinkedIn, April 2, 2016; tinyurl.com/y79a3wlh. Thanks to TPS Teachers Network members Tom Boer, Neme Alperstein, Cheryl Davis, Cheryl Best, Margaret Lincoln, and Mary Johnson and other staffers who shared thoughts. Some ideas are attributed to Voices and Inspiration, Insider Post, March 27, 2018; Insider Post, May 2018; and the TPS Consortium Guide for the TPS Teachers Network. Mary Alice Anderson (maryalicea@mac.com) is a TPS mentor and teaches a course on using primary sources for the University of Wisconsin–Stout. She is a former middle school media-technology specialist and was a Library of Congress American Memory Fellow. Anderson lives in Winona, Minn.